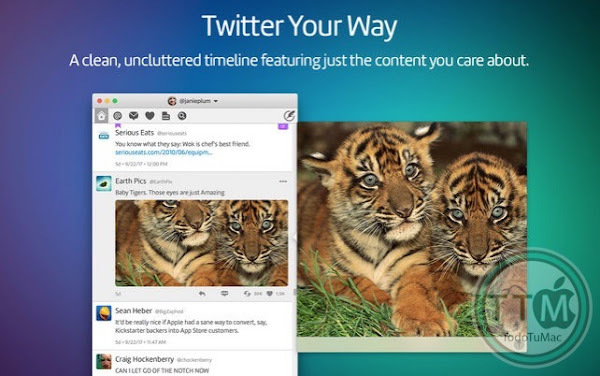 Re-imagined from the ground up to be the Mac's most friendly, powerful and modern Twitter client. Twitterrific makes Twitter fun. A clean, uncluttered timeline featuring just the content you care about. Tweets are presented in chronological order and other people's likes aren't placed in your timeline. Twitterrific feels right at home on the Mac. Support for Notification Center, Retina displays, built-in sharing, beautiful animations, full-screen mode & more. 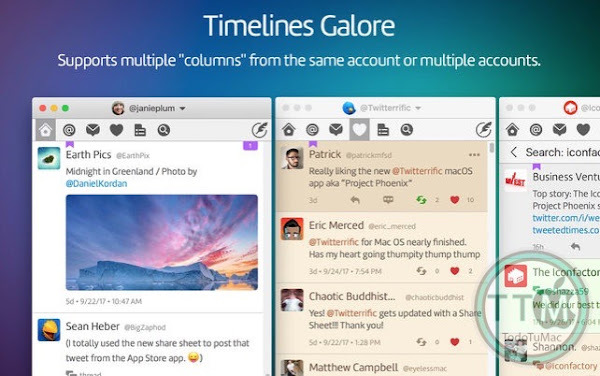 Take control of your tweets with multiple timeline windows from the same account or multiple accounts, all organized on your Mac’s desktop. Navigate the timeline, compose tweets, and even attach image descriptions quickly and easily using Voice Over. 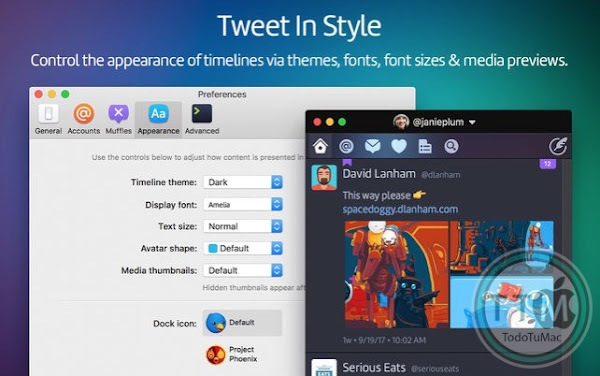 Twitterrific's appearance panel supports themes, lets you customize fonts & type sizes, and even lets you control how media appears in the timeline. Whether you use Twitterrific on your iPhone, iPad, or another Mac, the app automatically syncs your reading position for a seamless Twitter experience. • Simple to use, easy to understand. • View mentions, messages, and favorites quickly and easily. • Timeline syncing of reading position across all platforms via iCloud. • System-wide alerts for mentions & direct messages via Notification Center. • Fully accessible via VoiceOver. • Support for Retweet (RT) & Quoted tweets. • Quick access to Emoji when composing new tweets. • Autocompletion of usernames & hashtags while editing tweets. • View Twitter saved searches and lists. • Check out global and local trending topics. • Browse conversation threads between users. • Support for tweet storms & chained tweet threads. 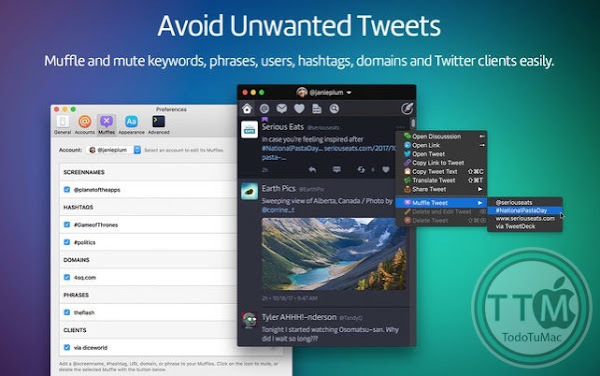 • Quickly Delete & Edit your own tweets. • Translate tweets to your native language. • Helpful color-coding of tweet types. • In-app media viewing for images, animated GIFs, Instagram & more. 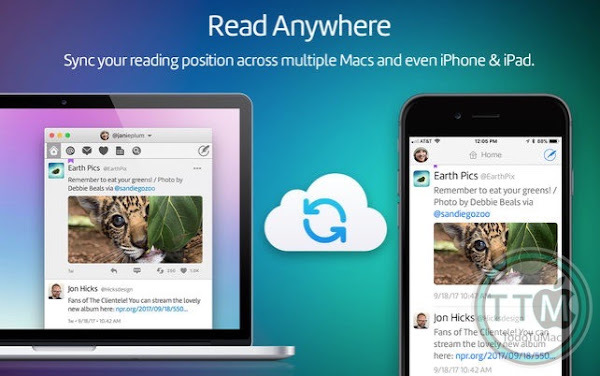 • Share a tweet with actions for email, Messages, Safari Reading List & more. 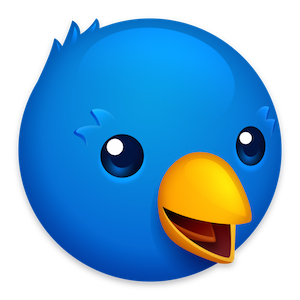 • Muffles & mutes synced from Twitterrific for iOS via iCloud. • Robust in-app media viewer with detachable popovers. • Customize the appearance of media in the timeline or hide it completely. • View user profiles including past tweets, likes & mentions. • Follow and unfollow other users directly from their user profile. • Block and report spammers with a single click. • Theme control (light or dark). • Font size & type face control. • Fixed a few crashes and improved automatic timeline refreshing. • Renamed the streaming preference to "Automatically refresh timelines". • Fixed a crash when uploading videos that were encoded a certain way. • Fixed a few other rare crashes.